Galaxy’s Edge will open at Disneyland on May 31 and Walt Disney World’s Hollywood Studios on August 29, but many details are still under wraps. 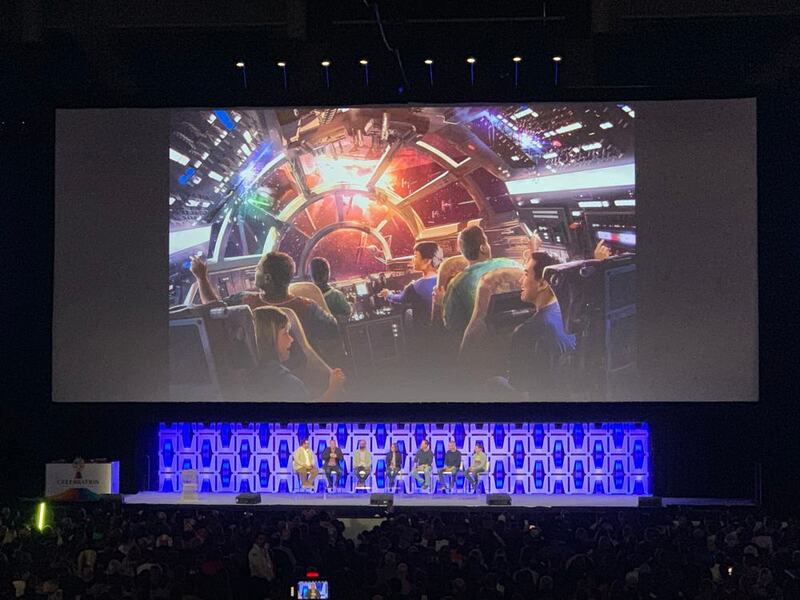 That changed when Walt Disney Imagineering team members Chris Beatty, Asa Kalama, Margaret Kerrison, and Scott Trowbridge, and Lucasfilm’s Doug Chiang and Matt Martin, shared new details at Star Wars Celebration. Related: What does The Rise of Skywalker mean? A really funny video of Josh Gad attempting to explore the Disneyland location opened the presentation, and it led to Gad himself walking out on stage at Star Wars Celebration. 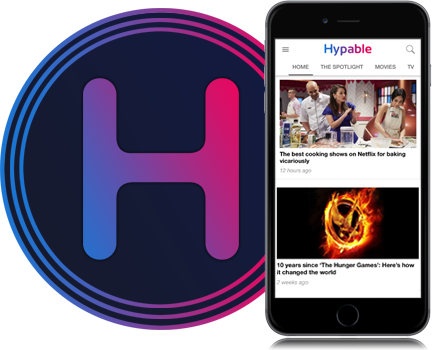 “What you just saw is going to be a new series on Disney+,” Gad quipped. Trowbridge described the land as a place where you are participating in the Star Wars world. It’s the biggest land Disney Parks has built. One of the new rides, called Millennium Falcon: Smugglers Run, feels like a real vehicle. You’ll be able to play with all the switches in the cockpit like you’re Han, Chewie, or Lando. Notably, you can steer the ship in any direction. It’s “truly up to you” to fly the ship, and engineers (other guests in the cockpit) will have to deal with the way you fly the ship. “It’s up to you and your flight crew to determine the fate of your ship,” Asa said. Even the hallway you walk out of at the end will look different depending on how you fly the ship. Celebration attendees were treated to a clip of Hondo in animatronic form in one of the ride’s pre-show scenes. Hondo is voiced by Jim Cummings, who also voices other big movie characters like Pooh and Tigger. Paul Reubens, the voice of Star Tours’ Rex, is also back. The other attraction, which will open months after Galaxy’s Edge does, is called Star Wars: Rise of the Resistance and is described as one of the most complex attractions any theme park has ever built. It’s set in a resistance campsite where you are a recruit. “Because it’s Star Wars, not everything is going to plan,” Trowbridge said. You’ll find yourself a prisoner of the First Order and be imprisoned on a Star Destroyer. It’s Disney’s biggest attraction ever, and Gad hinted that it’ll be a pretty long ride (or at least a long experience). You’ll get to encounter Kylo Ren, Rey, Poe, BB-8, and others. A teaser video for Rise of the Resistance offers a very small look inside the actual Star Destroyer attraction, and it looked like it was straight out of the movies. Gad asked why they wanted to create a new planet instead of an existing one. Chaing said they wanted to design an environment with purpose. “That was important… it wasn’t about designing around a single person, it was about designing your journey,” Beatty added. Matt Martin, an exec at Lucasfilm’s story team, said that they were building stories in Star Wars books that tie into the history of Galaxy’s Edge. A workshop within Galaxy’s Edge will let you build your own lightsaber — these particular light sabers are one-of-a-kind and have never been seen before. Food was also touched on — apparently Space Meat is going to be a thing, and yes, there’ll be blue (and green!) milk. 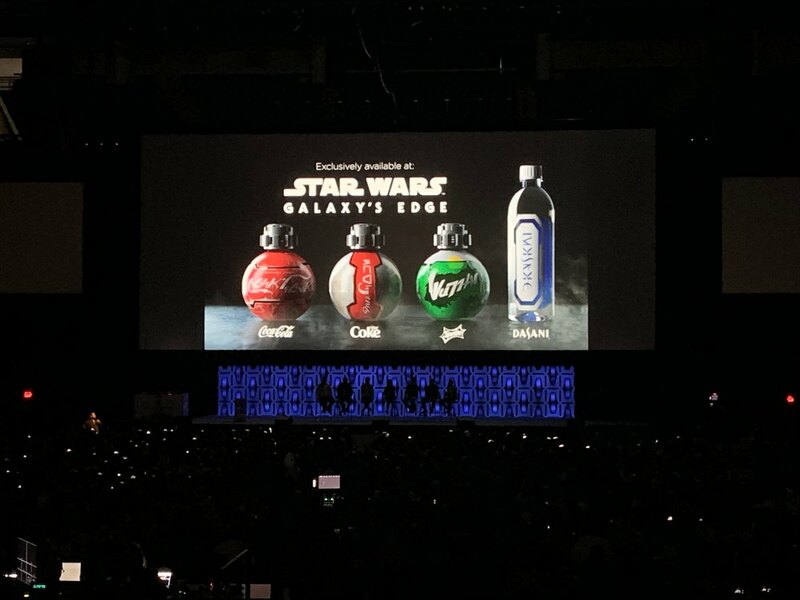 Speaking of drinks, the panel next turned to the Cantina. Rex, a popular character found in the existing Star Tours attraction, will be the star of the Cantina. The story for how he got there: Rex flunked his way out of Star Tours, and in the battle of Jakku, he crash landed. After he’s rescued by a droidsmith, he’s repaired and made into a DJ. The audience were treated to a couple songs from the Cantina. It has a jazzy, classic vibe that feels like it could fit in at any Disney Parks attraction. The second clip was from an all-droid band, and the track was very different from the first. It had a space/EDM vibe with a great bass. Execs also teased that Yoda will be making an appearance in the park. He’ll once again be voiced by Frank Oz. The team noted that everyone who they’ve been asking to return has been happy to participate. That includes John Williams, who’s composed “some amazing new music for Star Wars: Galaxy’s Edge.” We saw footage of Williams checking out the land’s models and concept art. Gad, a true Star Wars fan, revealed that he got to tour Galaxy’s Edge and couldn’t say enough good things about it. They played some new footage from inside the land, coupled with music from John Williams’ new score for Galaxy’s Edge. The level of detail and the massive scope of the project is awe-inspiring. Even on video you can tell it is a massive area. “It really is insane, and I stood in front of the Millennium Falcon and I genuinely started to cry,” Gad said. It sounds really special, and we can’t wait to visit! We’re just a little worried about the crowds.